I love gardens which once were lost, but have now been restored. How poignant and symbolic they seem, and how inspiring when they are recovered and given new life. A famous example is The Lost Gardens of Heligan in Cornwall; but we have a rediscovered garden just down the road from us. Just off the road between Warwick and Kenilworth you will find Guy’s Cliffe Historic Walled Garden. It used to be the kitchen garden for Guy’s Cliffe House, the atmospheric mansion about which I have already written on this blog. You can read my post here. But after the last heir to the estate, Sub-Lieutenant Algernon Percy, died in the First World War, the estate was broken up. For years this walled garden was lost beneath thick undergrowth, but in the last few years, the garden has undergone restoration by a team of devoted volunteers. I’ve visited the garden a few times, sited behind Hintons Nursery off the Coventry Road, Warwick; and my son Jamie, a horticultural student, has also spent some hours volunteering in the garden. The garden now is testament to the dedication of those who’ve freely given their time and expertise and hard work to bring it to its present state. It’s an ongoing project and has been featured on Gardeners’ World. Recently the gardeners have installed a new poppy wall mural to commemorate the Battle of Jutland, in which Algernon Percy, the last heir to the estate, died. What an inspiration this garden is; and it is also full of atmosphere, invoking a strong sense of the lives of those who worked here and loved the garden and nurtured it in the past. The Walled Garden is at the back of Hintons Nursery. I’m delighted to announce that the Pershore College team – of which my son Jamie was a member – was one of the 3 college teams who were awarded a Gold Medal in the Young Gardeners of the Year 2018 Competition at the Ascot Spring Show 2018. We went to the show on Saturday 14 April 2018 at the Ascot Racecourse and were inspired by our day there – many imaginative and enchanting ideas for gardens, the seven student Young Gardeners of the Year gardens to admire inside, and also the professional show gardens outside. Saturday was a day of bright Spring sunshine, perfect for the garden show. The event was also just the right size, so it doesn’t overwhelm the visitor, as can be the case with a major, hugely popular event like the Chelsea Flower Show. We particularly enjoyed TV gardener David Domoney‘s talk on Unusual Gardening Techniques, and we will certainly never look at eggshells, tea bags, plastic bottles, Deep Heat spray, rusty brillo pads and old socks in the same way again! We also heard a brilliant talk by Harvey Stephens, the Deputy Keeper of the Savill and Valley Gardens, the Crown Estate. He showed several slides of the beautiful flowers, shrubs and trees to be found in those gardens, and passed round some glorious blossoms: a pink Atlas Magnolia and a white Columbus Magnolia for us to all to hold and admire. He filled us with a strong desire to visit The Valley Gardens as soon as possible, at the height of their spring magnificence! It was so exciting to look at all the gardens the horticultural students had designed and built, and to see the young people there, ready to talk about their gardens. These are the garden designers and heritage gardeners and landscape architects of the future, and I loved reading about their intentions behind the gardens as well. The gardens were all intended for a small urban space, and all had to incorporate features of sustainability. For me, my response to a garden arises from what the garden makes me feel when I first see and enter it. The Pershore College garden gives a feeling of calm and tranquility. It is a minimalist garden, with an emphasis on white and with a mediterranean atmosphere. I imagined it as a “meditation garden”. I hope you enjoy these images which give just a taste of what an exciting, fun and inspiring day we had at the Ascot Spring Show. I’m delighted to say that Jamie, my son, will be representing Pershore College along with his fellow horticultural students, to compete with five other top horticultural colleges in the Young Gardener of the Year competition at the Ascot Spring Show in Windsor Great Park 13-15 April 2018. The competition was launched by TV gardener David Domoney on 16th January 2018 at Ascot Racecourse. In the photo above, Jamie is standing just above David Domoney (in the blue jacket). 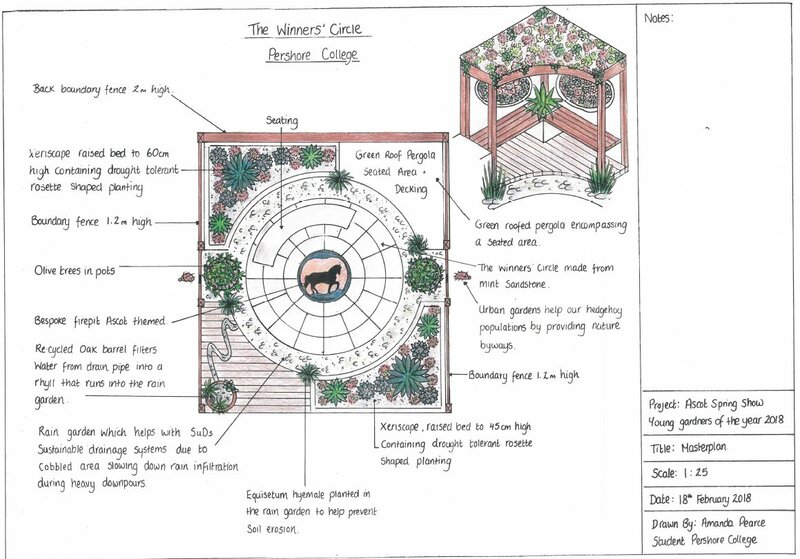 The horticultural colleges will compete to design and build a garden incorporating an equestrian theme. Jamie’s interest in gardening began during a vocational year in secondary school studying horticulture. The picture below shows him at Charlecote Park National Trust during his work experience placement, five years ago in 2013. The teams will be building their gardens during the two weeks prior to the show. Buy your tickets now to see the student gardens, to find out who won the Gold, the Best-in-Show – and to vote for your favourite garden in the People’s Choice! 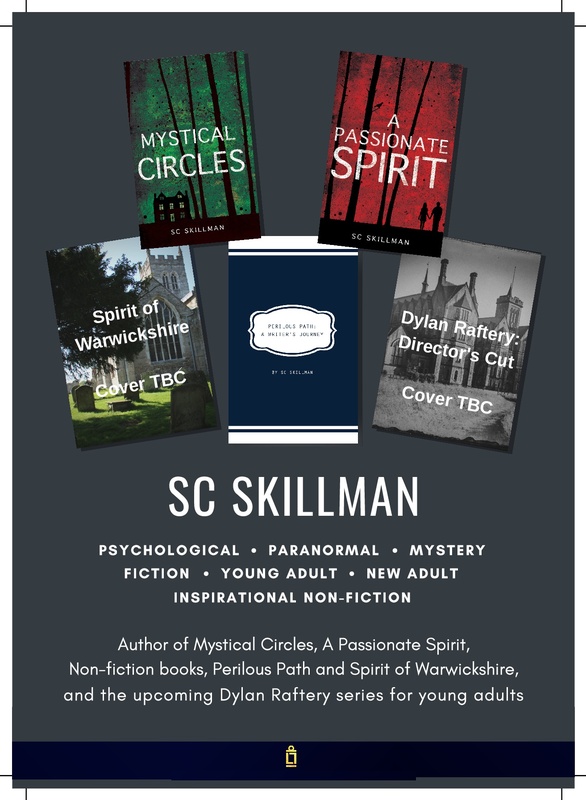 I’ll be blogging about the Spring show during the run-up and reporting on how the work is going for the Pershore College team… without giving away any secrets of course. And finally I’ll blog about the show and the gardens when they are revealed!